This week I am happy to present the third interview in the Stormtrooper photography series! The first two, conducted with Stéfan Le Dû and Kristina Alexanderson, were about daily photography challenges. JD Hancock kindly accepted to answer a few questions about his photo series for The Geek Anthropologist. I find it incredible how unique each photographer’s approach is to the Stormtrooper theme. It seems as if this character is used as blank canvas. Feel free to check out Le Dû‘s and Alexanderson‘s interviews. 1. How did you get the idea for this project? 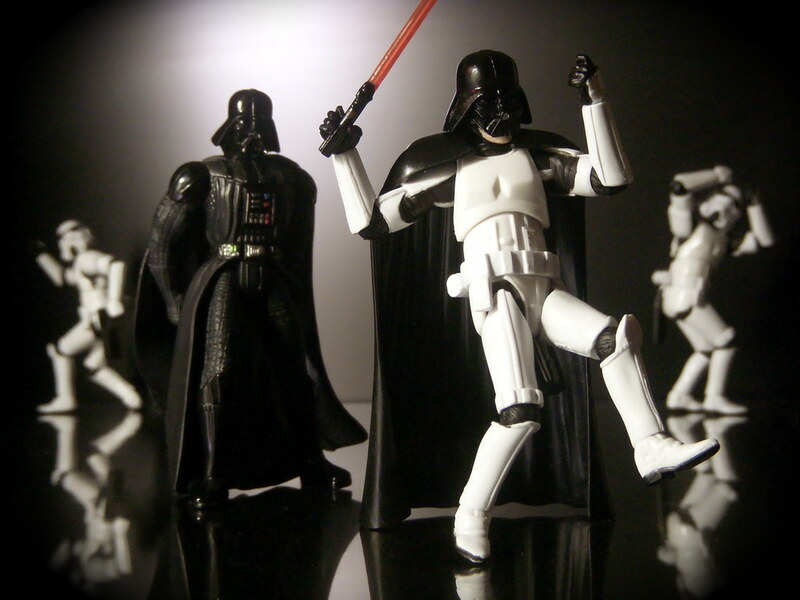 I have loved action figures ever since I was a kid. Star Wars action figures were a big part of my childhood, and when I saw other people on Flickr posting photos of stormtroopers and other Star Wars characters, I knew I had to join in the fun. 2. What are the main difficulties of such a project, and what are the aspects you most appreciate? 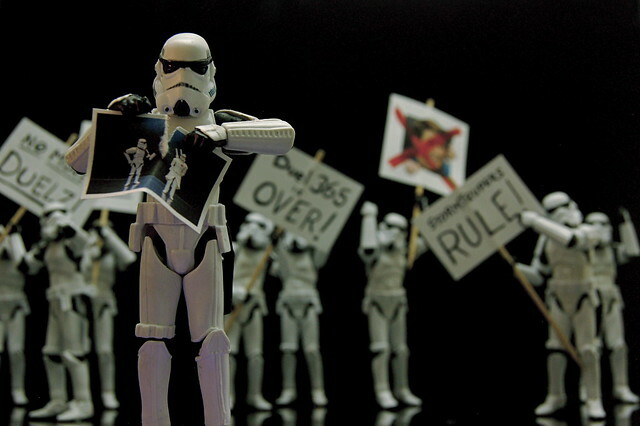 In the beginning, finding my “style” of stormtrooper photo was a challenge. My early stormtrooper photos are quite different from the kind I shoot today. What I most appreciate about stormtroopers is that because their faces are hidden under their helmets, people can imagine their emotional state based on the poses I choose for the figures. This makes it much easier to tell a story with a stormtrooper than with a figure who is always smiling or always angry. 3. Did the experience reveal itself to be different from what you expected? Yes. 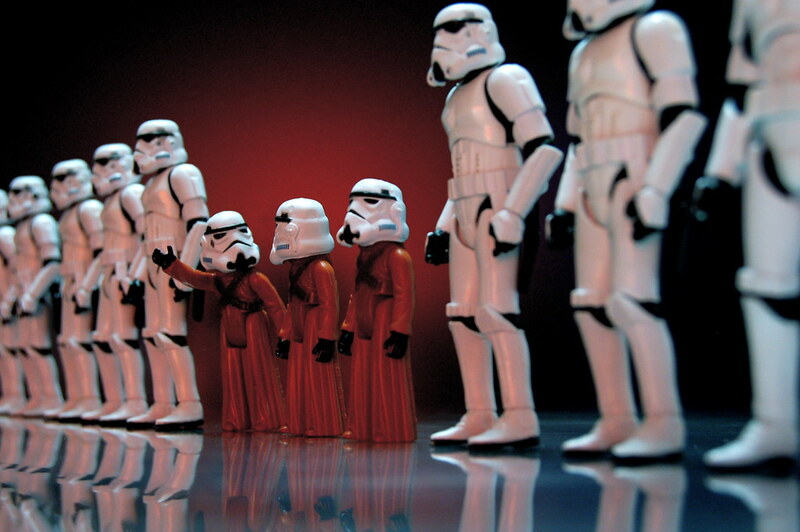 Seeing how other people react to and interpret the stormtrooper photos is sometimes more fun than taking the photos. People sometimes project their own experiences into the photos, which is fascinating to me. 4. Where do you find your inspiration for the photos? Sometimes I’m inspired by words or phrases using the word “storm” or “stormy.” For example, I have a photo named “Stormy Weather” and another named “Heart Of The Storm.” Other times I am inspired by an actual line or a scene from a Star Wars movie. And finally, I like to mix in things I like into the world of Star Wars, like Doctor Who and Pac-Man. 5. What reactions do you get to your photos? 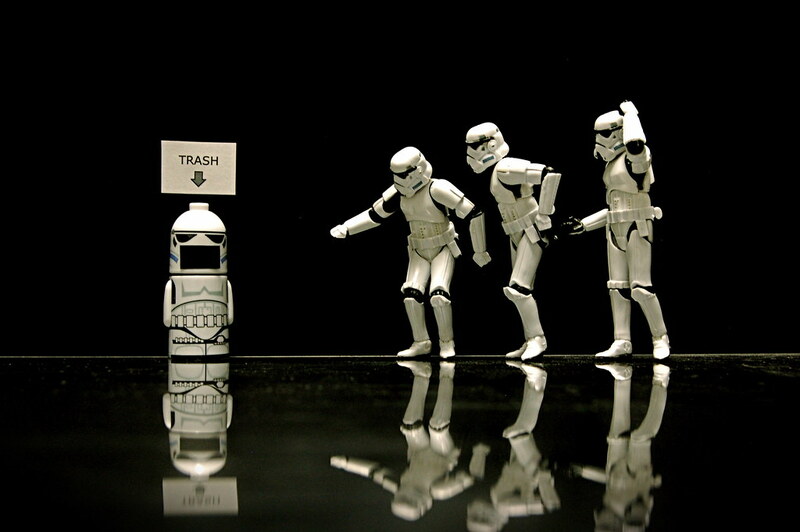 Many of my stormtrooper photos are meant to be funny, and thankfully people do take them that way. 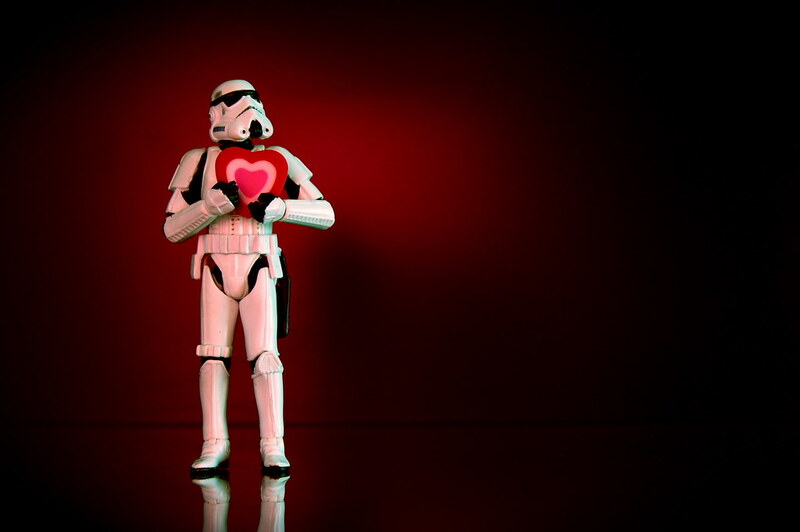 I hope my stormtrooper photos will brighten a person’s day. 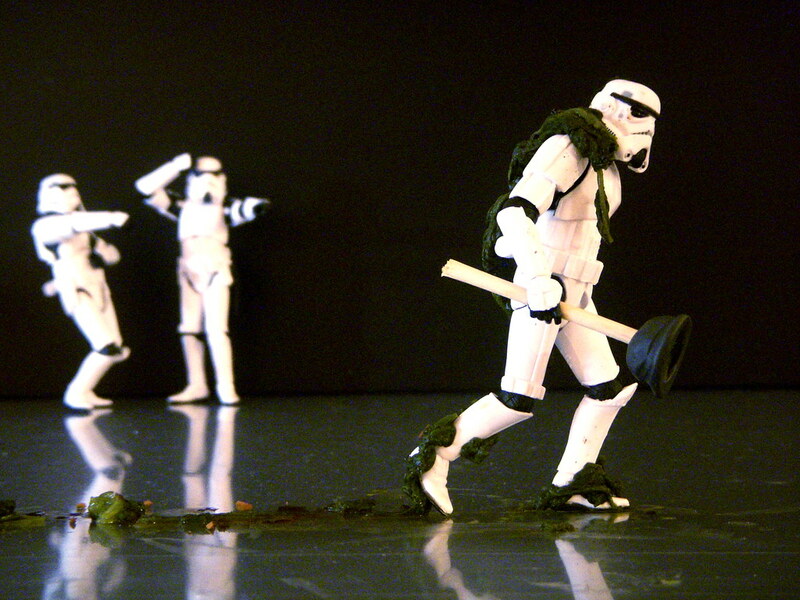 In my opinion this was the first stormtrooper photo that reflected my visual style and humor, and I like that my wife was able to create a realistic-looking miniature toilet plunger on request. 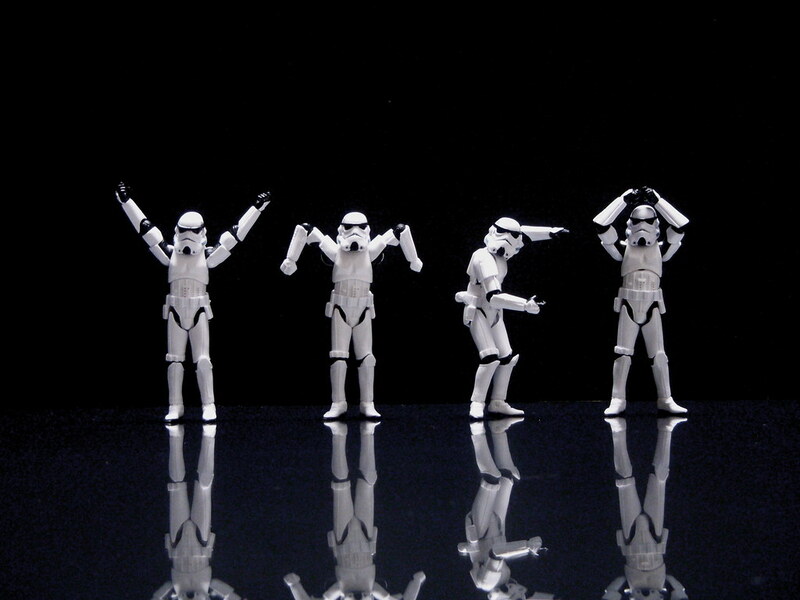 The YMCA stormtrooper photo is easily my most popular stormtrooper photo ever. I love this one because it was my wife’s idea, and it’s so funny. I did a series of Jawas-as-stormtroopers that were somewhat popular. This is the first one and perhaps my favorite. 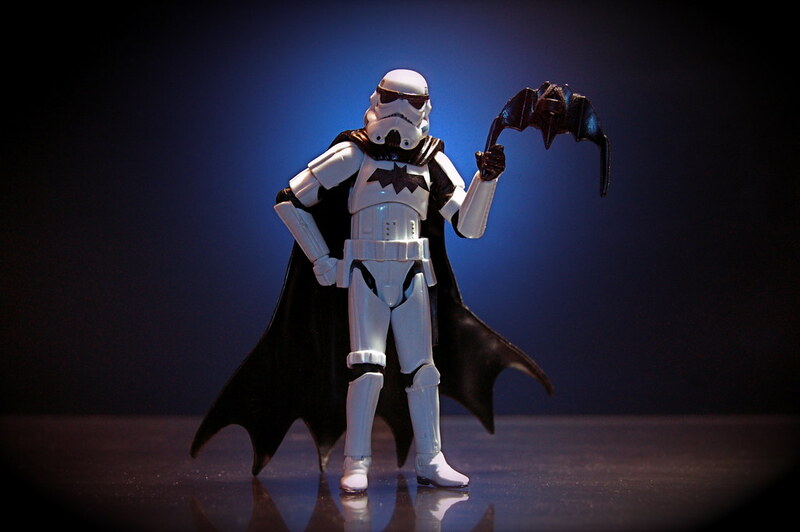 My Batman-stormtrooper mash-up proved that it doesn’t take much to turn an action figure into The Dark Knight. I love this one because it is colorful, it was inspired by a young Flickr photographer named WillyCoolPics, and my brother, who is a great photographer, helped me with the setup. The idea of these three stormtroopers trying to figure out why the Death Star trash cans have been redesigned to look like them is hilarious to me. I’ve seen this one used by other people around Valentine’s Day. I think it shows that simplicity can be powerful. Many of my non-stormtrooper photos use colorful glittery backgrounds to produce interesting visual effects, and I used the same technique here. 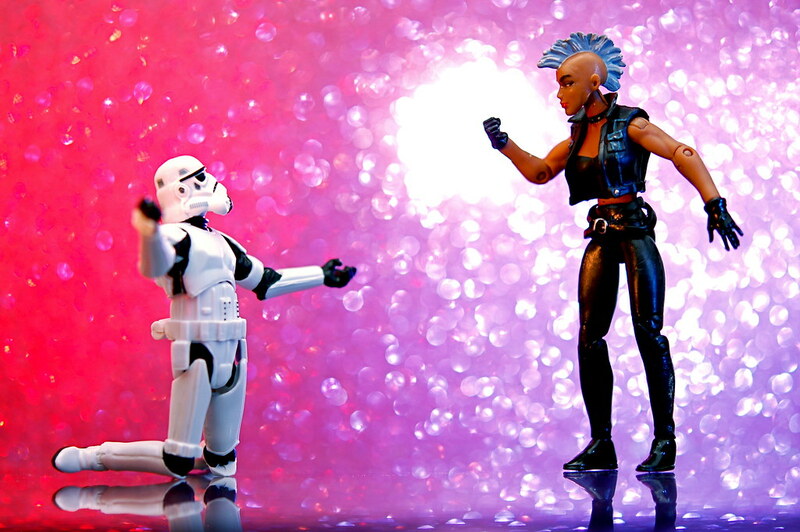 I also love the idea of the 80s-era X-Men Storm being romanced by a stormtrooper. I like using humor to address serious topics like hard economic times. 7. 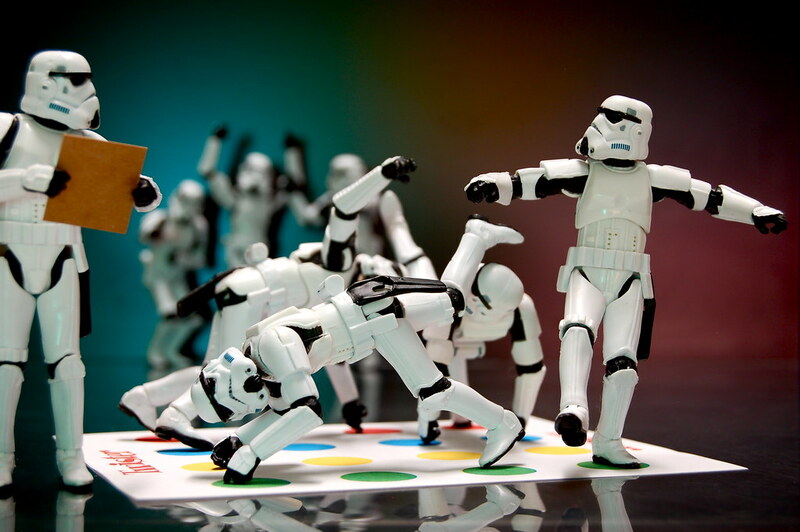 Why do you think Stormtroopers are such popular subjects for photo and video remixes in popular culture? Everyone can relate to the idea of a faceless, nameless enemy who is out to get them. I would like to think that poking fun at that enemy helps encourage people to face their own fears in some way and shows that maybe things aren’t as bad as it sometimes seems. 8. Are you a Star Wars fan? What importance does it have in your life? I am a Star Wars fan. My father took my family to watch the original Star Wars in the theater when I was seven years old, and like so many others I fell in love with it instantly. It had action, adventures, and a sense of hope against all odds. It was unlike any movie I had ever seen. For me, the message of Star Wars is that good will win out in the end. It may take time. It may take sacrifice. It may take going places you never expected. But in the end, good will win, and your efforts fighting evil will be worth it. 9. 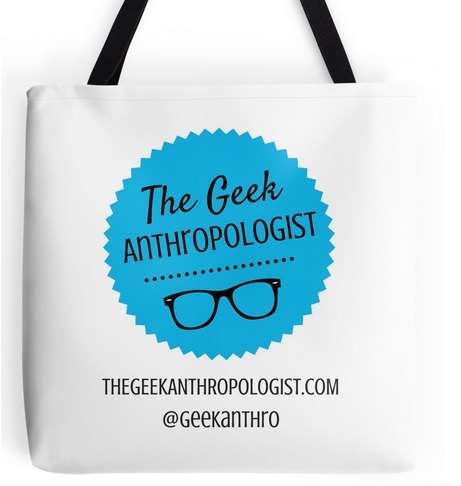 Do you consider yourself to be a geek? A Nerd? Something else? I guess I consider myself a geek. My interests include science fiction, comic books, action figures, super-heroes, time travel, technology, and the future, and those are pretty geeky topics. 10. 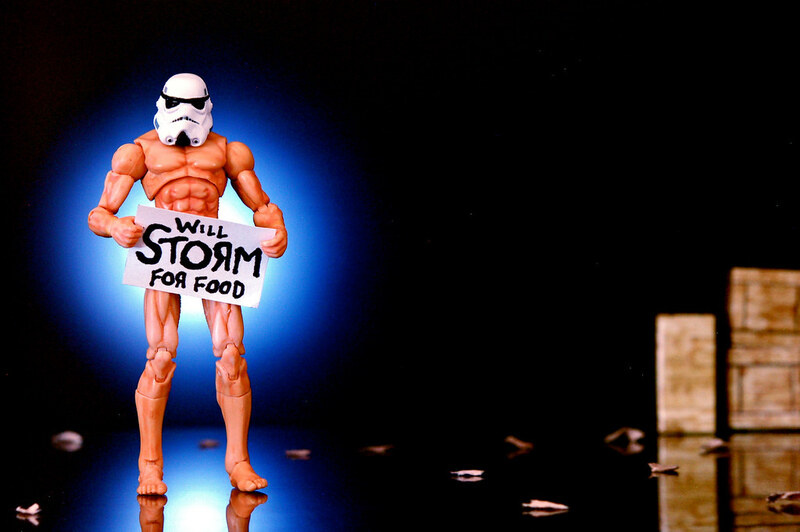 In addition to your Stormtrooper series, you create many photos with figurines. What inspires you to do? Why do you use them as subjects? Which images from you other series are you most proud of? As I said before, I’ve been interested in action figures since I was a kid. They are a representation of what we as people can hope to be (or hope not to be). I like the challenge of posing them in such a way that they can express an emotion, help tell a story, or give someone a chuckle. Other series that I’m proud of include the Little Dudes series which uses very small figures to tell little stories and The Doctor Is In series which shows poor Charlie Brown trying to find a new counselor. I’d like to thank JD Hancock once again for answering my questions! Make sure to check out his Flickr account. I’m pretty jealous of his Christmas tree, and here is my favorite photo from his stormtrooper series.